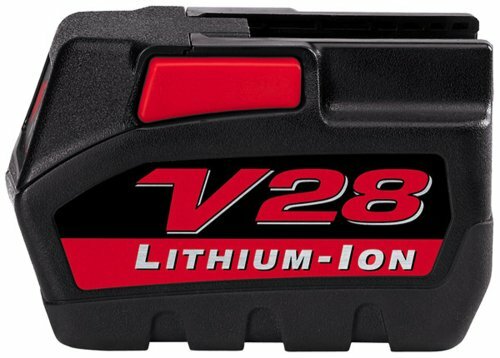 28 volt Lithium-Ion battery packs power the entire Milwaukee V28 System of power tools. The V28 Lithium-Ion battery pack offers up to twice the run-time of an 18V NiCd or NiMH pack and is actually lighter than 18V NiCd and NiMH packs! Lithium-Ion technology allows consistent fade-free power - meaning the first cut is as powerful as the last. V28 Lithium-Ion battery packs will never develop a memory and can be charged at any time regardless of the pack's current charge level! Press the 'fuel gauge' button and LED indicators display remaining charge left in the pack, providing an ideal way to check the state of the pack before you climb onto a roof or up a ladder. Do not let it get wet!!!! At the replacement cost you don't want to make this mistake!! I have had my v28 set now for a while and have used my tools for a variety of tasks. I am in the plumbing trade so most applications have been in relation to that. 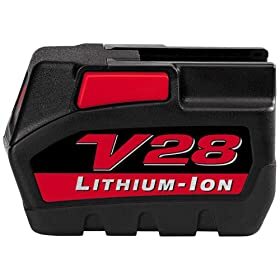 I own almost all of the v28 line of tools so these batteries have run my v28 radio, hammer drill, band saw, sawzall, angle drill, rotary hammer, circular saw, and impact wrench. I have never had a problem with the batteries at all in any of the tools I have used. They have gone from tool to tool with no problems whatsoever and in fact outperformed any cordless tool I have ever used. I can't speak for everyone but these battery driven tools have never disappointed me. Milwaukee finaly made a battery that matches their tools.The milwaukee tools were always strong, durable, and very dependable. I have owned the 18 volt combo set for years and love the tools, the batteries are a nother story, they were very weak in power they would not last for the smallest jobs (I own 4-18 volt batteries)for the set. But this new 24 volt lithium battery finaly matches the tool, I have 3-batteries for the kit and the power is amazing. the batteries hold a charge for the longest time.They will last the day. Milwaukee did a great job with this battery. The battery's great with the known cold weather requirement that you keep it working to keep it warm and up to power. I've kept full charge on my two batteries after weeks of inactivity so I don't know why others have problems with self discharge. But Milwaukee has been very slow in releasing a wider selection of V28 powered tools so I'm forced to look at other brands like Makita and Dewalt with somewhat wimpier batteries but a wider selection of quality tools that customers want. -Wow does the price vary; $50 last winter to $118 in late spring '08 so wait til winter to buy if you can. I have six batteries and three chargers that power my crew's circular saw, band saw, 2 hammer drills, sawzall, rattle gun, and roto-hammer. They have been our primary tools over the last year and a 1/2 and have done most of the concrete work on one high rise and one 120,000 gallon fish tank. the battery has enough power on the skilsaw to rip a 16ft. 2x4 down the middle. the porta-band is a juice hog. have drilled as many as 130 3/16" inch holes through 3/16" tempered steel on one battery. the lone drawback is that if the batteries are left out overnight in the cold, like in a gang box in Seattle, a full battery can go dead in minutes. but will last hours in the cold after heated up on the charger. 6 full batteries last a crew of 5 an eight hour shift of constant use with only charging a couple of them on the 1 hour charger. the man hours saved are outrageous. Wow, when I replace my aging cordless drill with the new Milwaukee V28 series stuff...breathless. The power, staying power and recharge times have been all impressive so far. I especially like the battery life meter. Only down side is the cost. But you do get what you paid for. So go get one now! I own the impact hammer and the band saw and use both with only one 28V battery pack. Obviously, there is only so much I can do with only one battery but to date it has worked very well. The fuel gauge is essential if you have a large job pending as it will tell you if you need to recharge. The band saw uses a lot more of the battery than the impact hammer. I used the band saw to cut 1/4" grating and had no problem with the battery as I had several things to do between cuts which also allowed me to recharge when the battery ran low. The impact hammer can drive anything to any depth except lug nuts. Have to be careful not to drive to tight though. I rated the battery only 4 stars as when not in use the charge drops quickly. i.e. several days it is down to 1/4 charge. The best battery and tools on the market! This battery is powerful and charges quickly. Holds a charge for a long time seeing I use these sporadically and not a professional contractor. Great battery for great tools!!!! I order these for my brother who is in the construction trades. He absolutely gets them cheaper and on time here in florida. good quality-good value. no problem. The battery's great with the known cold weather requirement that you keep it working to keep it warm and up to power. But Milwaukee has been very slow in releasing a wider selection of V28 powered tools so I'm forced to look at other brands like Makita and Dewalt with somewhat wimpier batteries but a wider selection of quality tools that customers want. New slogan for Milwaukee: "GREAT TOOLS; STUPID MANAGEMENT". I use this battery to power the Milwaukee job site radio and it does a great job. It has plenty of power and charge lasts a long time. Also, it charges up very fast(45 minutes) and love the built in battery strength lites. All in all, a quality product but not cheap. Nothing good rarely is.